Richard Lee Neiden - has been scrolling since he was eleven. He started making ornament cuttings and got hooked. Today he has been scrolling for around 13 or 14yrs and has enjoyed every minute of it. Just a few short years ago Lee learned how to design his own patterns and is now a pattern designer. He is the author of "Transportation and Vehicle Patterns for the scroll saw" and has more books coming out soon. In High school and College Lee took multiple graphics courses using Adobe Photoshop and he now uses it to create scroll saw patterns. Lee has published a book of car portrait patterns and he is currently working on book number two. When hes not in the workshop cutting you can usually find him designing his next project or chatting with the club about this or that. 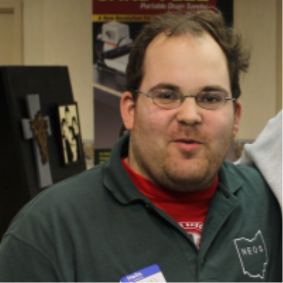 Lee is also one of the creators of the "North Eastern Ohio Scrollers" and he is currently the president of the club. Along with the other officers and active members Lee works hard to make sure the club is a success in everything it does. "This club is like a second family to me, I consider each and every member my friend(s) . It has been a great time bringing together scrollers from all over North Eastern Ohio and I hope the club can continue to thrive. I hope we can have some fun along the way after all that's what this is all about".